Martin Wolf is director of product and environmental technology for Seventh Generation, a Burlington-based company that manufactures enviro-friendly soaps, detergents, cleansers and paper products. Earlier this year, Wolf, who consults with lawmakers and the industry on toxic-substance regulation, was a strong supporter of S.137, a law that bans the sale of dish detergents containing more than “trace” amounts of phosphorus. So Wolf was surprised, at a convention held earlier this month in Anaheim, California, to hear representatives from the Organic Consumers Association criticize his company for marketing supposedly “natural” brands that contain substances linked to cancer. The OCA, an advocacy group based in Minneapolis, claims Seventh Generation is exploiting a federal loophole that allows companies to call their products “natural” instead of organic, which is subject to more rigorous testing. As a result, the OCA says, Seventh Gen is marketing a green image while lacing products with a chemical — called 1,4-dioxane — that is designated as a “known” carcinogenic under California law. Meanwhile, S.137, the bill that Wolf helped pass, is part of a broad legislative effort to put Vermont “at the head of the pack” for toxics prevention, said State Sen. Virginia “Ginny” Lyons (D-Chittenden). The Senate also passed S.261, which would ban the sale or manufacture of toys and baby products that contain phthalates, known as toxic “plasticizers.” Another bill, S.152, which would regulate lead-based consumer products, was moving through the chamber earlier this week. Lyons wanted a more comprehensive approach to toxic prevention in Vermont, but S.292, which would establish a toxic-substance-identification program, will likely die in committee. Paul Burns, executive director of the Vermont Public Interest Research Group, said that because Vermont doesn’t have a “legacy” of industrial pollution, state legislators are more willing to take a piecemeal approach to regulation. By contrast, Massachusetts passed the landmark Toxics Use Reduction Act in 1989, which, according to Burns — the former toxics director for the Massachusetts PIRG — takes a “precautionary” approach to toxics regulation. Indeed, in the wake of well-publicized recalls of Chinese-made toys and other products, consumer awareness of toxic substances appears to be rising. However, Lyons fears that any state-level progress will be hampered by a chronic lack of federal oversight. 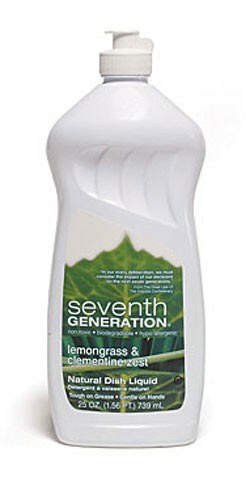 Seventh Generation, on the other hand, has been disclosing ingredients voluntarily for years, said Wolf, a member of the Soap and Detergent Association, a D.C.-based trade group working to pressure large manufacturers to follow greener practices. In fact, at least one industry behemoth appears to be cleaning up its act. Next month, Colgate-Palmolive will begin marketing a new phosphate-free detergent.